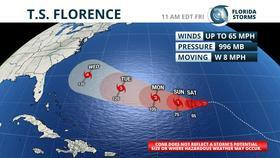 Florence became the season's first major hurricane Wednesday, but has since weakened to a tropical storm due to strong winds aloft interfering with its circulation. 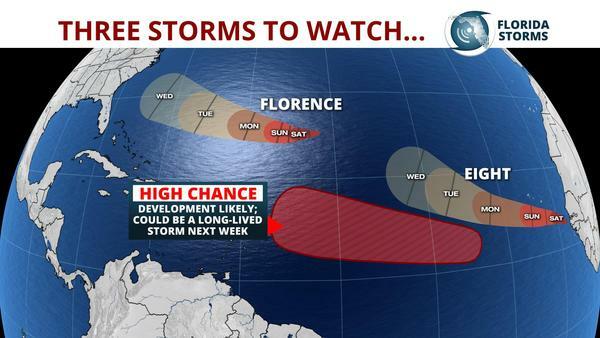 Those winds, often referred to as wind shear, are forecast to relax this weekend when the National Hurricane Center expects Florence to strengthen again into a hurricane. Florence could even become a major hurricane (again) as it moves in a general west-northwest direction and comes close to Bermuda Monday. The National Hurricane Center has expressed a reasonable amount of confidence in the forecast track and strength of Florence over the next five days, but in a recent advisory Hurricane Specialist Eric Blake said the uncertainty beyond day 5 is “very large”. He went on to caution residents along the U.S. East Coast that it was too soon to determine “what, if any,” impacts Florence could have in those areas. Regardless of Florence's eventual track, large ocean swells are likely to arrive along the beaches of the Mid-Atlantic states, resulting in life-threatening surf and rip currents. 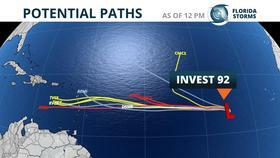 A vigorous tropical wave located about 500 miles west of the Cabo Verde Islands is likely to become the Atlantic Basin's eighth named storm by Saturday. The disturbance, labeled for the sake of forecast modeling as Invest 92, has the potential to become a long-lived tropical storm or hurricane over the next week to ten days as it moves slowly to the west. It is too early to speculate whether Invest 92 will become a threat to land, but it is worth noting that more than half of the runs from two reliable forecast models (the European and GFS) show it tracking into the eastern Caribbean by late next week. There is no consensus, however, on how organized or strong it might be at that time.